Hey guys, it’s Jacqueline! If January weren’t already the month for organizing your home, leave it up to Marie Kondo to officially kick people into gear in 2019. 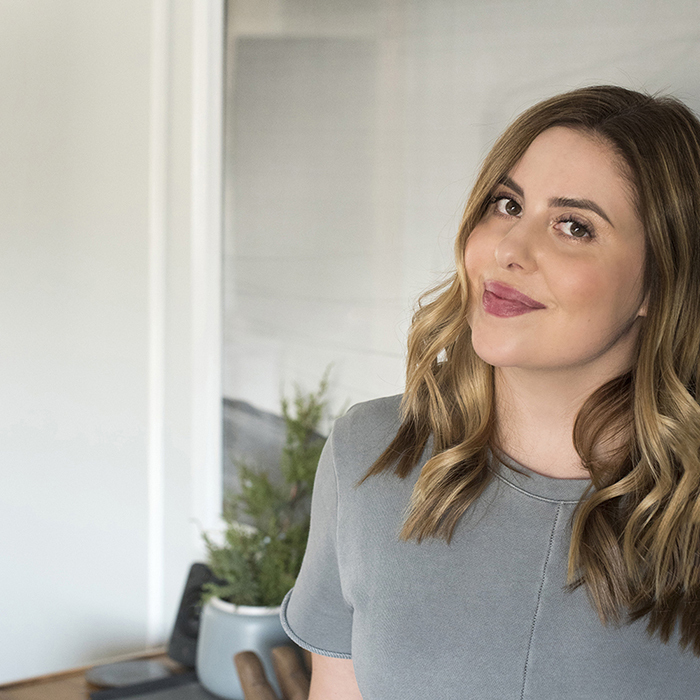 Has anyone else been super inspired by her Netflix series recently? I already consider myself a pretty organized person and a lot of the Konmari method could be considered “common sense” to Type 1 neat freaks like me, but it’s just so inspiring (and I will say I have learned a new thing or two from watching). After finishing our kitchen renovation last fall, I’ve been working on getting the cabinets, drawers, and pantry organized. It’s a project I’ve been wanting to tackle for awhile now and haven’t had the time for. Let’s just say I’m feeling extra motivated this year after watching a few episodes and our kitchen is on the way to looking the best it has ever looked! 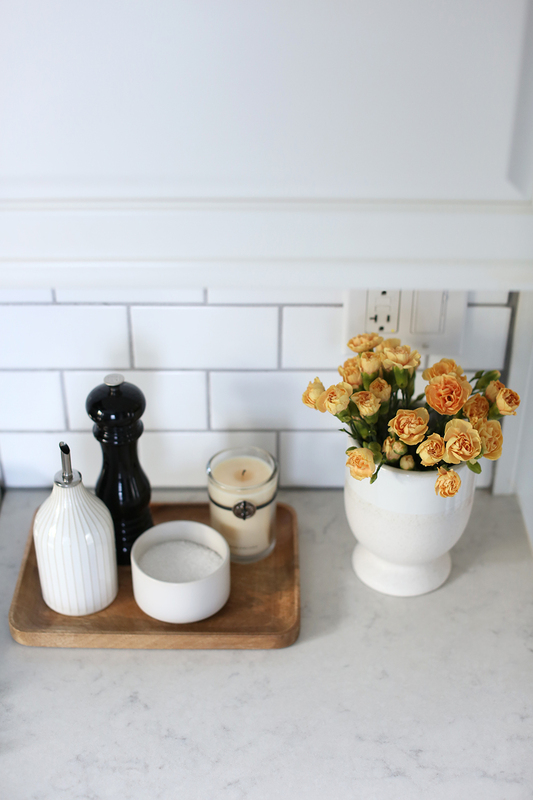 Click through to check out some of my favorite items I used for organizing our kitchen. Let’s start with jars and canisters. I’m into using beautiful canisters to hide the not-so-pretty packaging most ingredients or snacks come contained in. I selected these market jars (Number 1) to neatly hold the flour and sugar because they’re so frequently used. I chose clear jars so I can always tell when I need to replenish. As for that matte black canister (Number 6)? You would never know it, but it actually holds Piper’s dog treats! It’s much more functional and beautiful than digging for a bag in the pantry. Canisters are a great way to store ingredients and keep them out for quick access. Even if they’re enclosed in the pantry, they make any cabinet or shelf easier on the eyes, while being extra functional. Again, I’m team clear canisters because they require one less step… labeling. You can see exactly what you have and how much. You guys know how much I loved using baskets and bins to keep Luca’s closet in the nursery organized! Now I’m working on a similar project in the pantry. After a quick trip to The Container Store last week, I’m well on my way to have the most beautiful pantry ever. It’s a very narrow, but deep cabinet- so I opted for clear pantry bins (Number 3) that I could label and organize by groups. It makes it much easier to see where everything is, and I no longer have to reach all the way to the back of the pantry or dig through items stacked on top of each other (which was a total nightmare). I found this bread box (Number 4) on Amazon of all places, and it’s one of my favorite recent finds! It’s about half the price of a very similar designer option… score! I purchased Number 1 for canned goods (so they would be tucked away) and a few stackable bins for potatoes, onions, and other produce I frequently use. I also enjoy a good wire basket (Number 5, Number 7 and Number 12) for storing kitchen linens. Remember Sarah’s pantry organization project? She used Number 6 in her last kitchen, pictured below! Similarly to baskets, bowls are another good organization vessel for the kitchen countertop. I like to keep fruit nearby for fast breakfast options, and this is a great way to display them on the countertop. Adding a little color to the kitchen via citrus also never hurts! Last but not least…trays! I love to use trays to corral loose items on the countertop that I use everyday for cooking- such as salt, pepper, and oil. The one pictured above sits next to the range so I don’t have to go back and forth between the pantry and the stovetop. Not to mention, it looks much nicer styled and organized this way! Although I love all of the options below, my best design advice is to choose something that doesn’t match your countertop to add contrast. For example, I love Number 2, but since I have quartz countertops with a similar marbled look, it wouldn’t be a great fit for my kitchen. Another hack for corralling items is to flip a cutting board over and use it as a tray! They work just as well stacked against the backsplash or placed horizontally to hold ingredients, containers, or spices. Is anyone else working on organizing their kitchen this month? I would love to know what areas you’re tackling and which items you’re using to organize. Or maybe you’re like me and have been putting it off for while? I know it seems like a daunting task, but I promise it’s worth it in the end and you’ll feel amazing once it’s finished! I feel like I can breathe again knowing where everything lives. It has also made my dinner routine much faster. I’m a big fan of mason/canning jars for storing food. They work so well – easy to use (open/close, wide mouth), easy to clean, you can line them up nicely and since it’s glass, you can always see the contents. Washi tape (which is so cute and colorful) is great for labeling. I have a pretty good collection of jars – all different sizes – and use glass to store everything from peeled garlic cloves to oats. I love that you added all of the different baskets and jars. I definitely have my eye on a few of them. I recently finished a cabinet refinishing project and am now getting into the organizing stages of my kitchen. 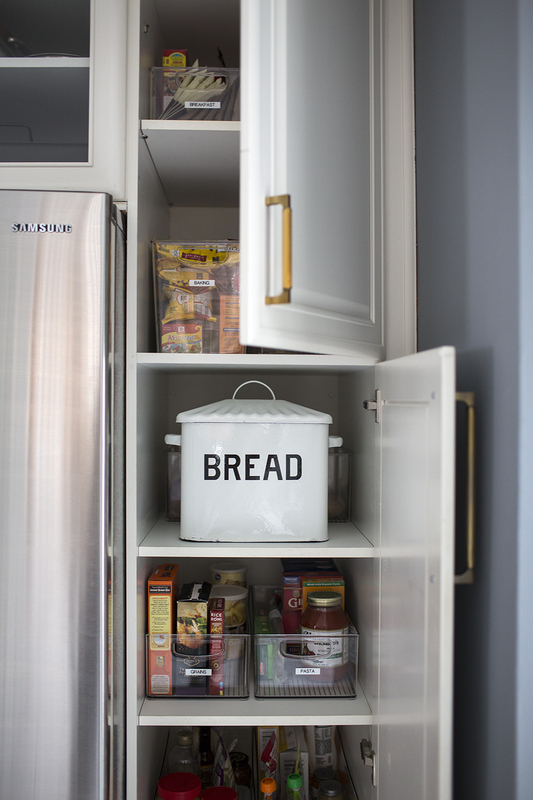 This post was so helpful and gave me tons of inspiration to create astenthteically pleasing and functional storage. Thank you Jacqueline!! Thanks, Lindsay! I am glad you enjoyed the post and it helped with some inspiration for your own project. 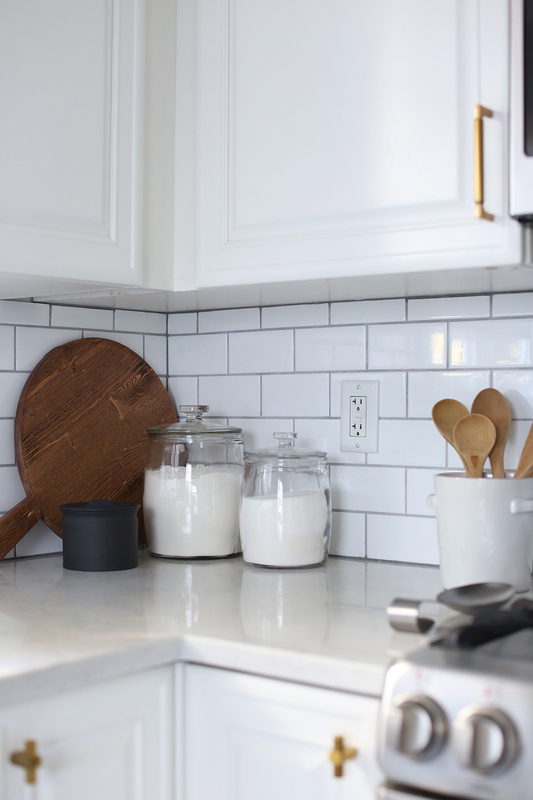 I will say, I have been loving our kitchen so much more since we tackled this project. We still have some work to do when it comes to kitchen organization but every little bit helps!